Pleasant deodorizer for any housekeeping environment. Keeps rooms fresh and fragrant. 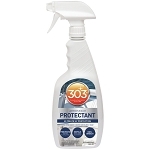 Attacks odors trapped in carpeting, upholstery, and draperies without staining. Specially formulated to eliminate offensive odors without wet fallout. Perfect for bathrooms, sick rooms, basement, smoke-filled rooms, offices or automobiles.